An easier ride today and stop at the Balladonia Roadhouse. Last night had an impressive electrical storm, lightning and thunder. I moved my tent onto the asphalt since I suspected my original site could become a mud puddle. It rained hard, but not very long. I shared the roadside rest area with a truck carrying an oversized tractor and also a pilot car. They left before I did as it just got light. I was packed up and on the road not long thereafter. Trees along the route again today. No wind was a nice difference. Route initially went downhill. Had I climbed that much? Rest of day mostly slightly rolling hills. A campervan was stopped along the way and offered a fill of water and a coffee. Had a brief chat and then continued, reaching Balladonia by 11am. On the way a car passed with sign "Ansett Flight 00; First Class" (a reference to recent demise of the airline and stranding of thousands of passengers with now invalid tickets...using alternate transport). Met the couple from Adelaide later. Balladonia started as a large sheep ranch of 121,000 hectares (300,000 acres) with 10,000 sheep. A telegraph station was built in 1898. A road was built across the Nullarbor in 1941. The WA section of that road was sealed in 1969 and the South Australia section was sealed in 1976. 83 km today, 17266 km cumulative. Digital clock at the motel gained 15 minutes overnight. Generators for the roadhouse must have difficulty maintaining 50 Hz. I also set my watch ahead, but by 45 minutes. East of Caiguna is a time zone offset from rest of WA by 45 minutes. I believe that when parts of Australia change to summer time in a few weeks, there will be six different times on the continent since WA, NT and Qld do not have summer time. (Relative to WA - Western Australia: 0:00, Eucla: 0:45, Northern Territory: 1:30, Queensland: 2:00, South Australia: 2:30, Victoria/NSW/Tasmania: 3:00). Seems confusing to me. I still left similar time relative to the sun, now 6 am Eucla time. Several road trains waiting around the roadhouse including one carrying a huge oversized steam shovel. A normal car could easily park inside, and the cab to the truck would have almost fit. Today I had many road trains passing, particularly early in the day. The route went mostly straight for 35 km to the ruins of the old Balladonia station and telegraph post. Here it turned a corner and started the "90 Mile Straight". Listed as 146.6 km long and the longest straight road in Australia. I stopped briefly for a photo. Up through 90 km, the route was mostly wooded with intermittent clear areas. After that it was open with few trees. Winds slowly picked up through the day. For brief stretches I could feel it helping me along, but mostly perpendicular to my travel. There were a few rest areas marked, at 50 km, at 113 km and at 129 km. The last of these had a sign for a water tank and I pulled in there. The rest area had two large tanks partially under a 10m x 25m shelter. I had lunch with a couple from Wollingong and then read for a bit hoping the wind would shift. When it didn't, I pitched my tent under the shelter and in lee of one of the tanks. Overnight a front came through. Started with strong west winds and including a brief period of heavy rain around midnight. I was happy to have the tin roof over my head as well as nylon tent. 129 km today, 17395 km cumulative. Tailwinds! The front last night cleared away clouds and left blue skies again. Also a good wind from WNW, so almost from behind. I discovered a large spider had decided to claim my helmet as home. Fortunately, he tipped out before the helmet was on my head. With the helmet on, I went back 500m to the road and continued along the 90 Mile Straight road. It was still very open terrain with no trees. Just 12 km down was another tank and shelter where I stopped briefly for a bite to eat. Two caravans parked under the shelter, same idea as I with my tent. At 47 km, was a brief stop at Caiguna Blowhole, an opening to underground caverns below. Apparently winds through some of these holes can get to 50-70 km/h with appropriate differences in pressure. Also a brief board explaining that with 250 mm of rain per year, the Nullarbor was one of the driest limestone regions in the world. Back on the road and at 52 km was the first turn and also Caiguna Roadhouse. Caiguna was having a morning rush hour with half a dozen trucks and several caravans. Still quick service to get brekky, check the map, and get on the road again. After Caiguna was an occasional bush here and there, but still nice winds. Made reasonable time to Cocklebiddy Roadhouse by lunch. I arrived at Cocklebiddy just after a bus arrived, so a bit busy and bit of a wait for lunch. I had ridden 117 km and considered stopping for the day. However, it was just past 1 pm and winds were still favorable. So I set off towards Madura, another 91 km further. Along the way to Madura were more bushes. Otherwise, repetitive scenery from before. A turnoff to the Eyre Bird Observatory, on the coast 35 km away. Winds continued and allowed me to make good time. Just 2 km prior to Madura was a sign for Madura Pass. Had I climbed this much to get here? A nice 2 km descent down to the roadhouse. Ready for a rest after a long ride. 208 km today, 17603 km cumulative. Made it to South Australia, fifth state/territory so far! More wonderful tailwinds today. Left Madura before sunrise with flags flapping in the breeze. The route to Mundrabilla was almost flat and followed a low rise (Hampton Tablelands) that was to the left. Small scrub and occasional trees. At 10 km, I went over part of the road designated as Royal Flying Doctor airstrip and two more later in the day. The RFDS is the most popular charity in the outback with collection bins at many roadhouses. My speed was zooming along with the nice tailwinds. This is supposed to be a remote part of Australia. However, twice today had a phenomenon of someone passing in caravan, stopping and having a brief chat with a caravaner I had met a month ago. First were caravaners from Aubury, NSW who I had met at Mary Pool (July 19th). Next was a couple from Tasmania in campervan who I had talked about employment laws at Dunham River (July 15th). Fun! Reached Mundrabilla Roadhouse by 11 am. I'd already ridden 116 km, but tailwinds were too nice to pass up. 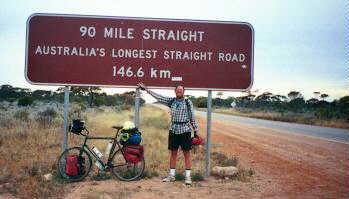 I also heard that Brendan and Wendy had stayed the previous night and were heading towards Eucla. I set off the 66 km towards Eucla. The number of trees slowly diminished, but continued to follow the low hills eastwards. About 30 km before Eucla, a caravaner flashed lights and stopped. Just passing a note from B & W (can't remember the names)...they are going to Border Village today. I had passed a "I'm a day behind you" note in similar fashion a few days before. The last 2 km into Eucla, climbed up the hill, named Eucla Pass and was at the motel/roadhouse. Brendan and Wendy were there and we had lunch together. They had just picked up a food parcel mailed before. I picked up some crackers at the roadhouse. No fruit to get here though. We rode the last 12 km to the border. I stayed at the roadhouse. Still quick riding with our tailwind. Another long day of riding, though the winds made it pretty easy again. From what we could see of the weather forecast at Eucla, tailwinds are not expected to last. 195 km today, 17798 km cumulative. What a difference the wind makes! After two days of tailwinds, I had crosswinds and headwinds today. Took much of the day to ride 101 km. Views and landscapes were particularly stunning. This part of the coast drops off abruptly to the sea in a 200 km line of cliffs that are 40-90 meters high, as if the continent was sliced off. The road runs between 300m and several km back from the edge. Most plants are very short, with just a few taller bushes nestled out of the wind. One can thus see for long distances and at several points a side road leads several hundred meters to an overlook where one can look over the cliffs and sea beyond. Last night I caught up with Brendan and Wendy. Had fun comparing notes, plans and experiences. They're still doing well and in addition to riding, also raising funds and awareness for Leukemia Foundation. Where/when did you start and plan to finish? Overall, fairly friendly folk, and I don't mind answering similar questions. 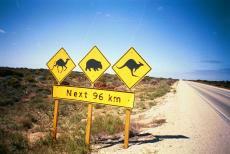 At 88 km was a caution sign for camels, wombats and kangaroos. Emus have been replaced by wombats on the signs. 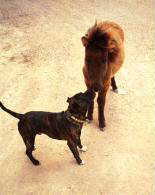 I still haven't seen a camel in Australia (other than penned in at Sandfire). Most of the other people I ask haven't seen one either. Saw the 100 km sign and shortly thereafter a "P" sign, so decided I'd reached a reasonable distance and had enough wind for the day. Pitched my tent in lee of a bush and read out of the wind. 101 km today, 17899 km cumulative. Another day of headwinds. Light when I started at dawn, but increasing through the day. The road continued along the cliffs. After 10 km was the first overlook. I went out 600m from main road over cliffs to waves breaking on the rocks. There was a second overlook at 30 km. This one had a road grader with a plaque to commemorate paving of the road 25 years ago, completing September 1976. It also commemorated Edward John Eyre and his aboriginal companion Wylie who made a crossing from Fowlers Bay, SA to Albany, WA in 1841. During the crossing, Eyre and Wylie had camped in this area on March 8th before reaching Albany on July 7th. I found it interesting to see that Eyre averaged only 10 km per day. With sealed roads, Eyre and Wylie could now ride in two weeks on a tandem or two days in a caravan. After the second overlook, more slow steady riding against the wind. There was a water tank at 40 km, though it was dry. Unlike tanks in NT, these have more ominous "boil before use" or "drink at own risk" type signs. There were still some occasional bushes or even low trees. As I got closer to Nullarbor Roadhouse, these became sparser. Two km from the roadhouse was a large sign, "Western Edge of the Treeless Plain". Made it to the roadhouse for a late lunch. There were still enough hours of daylight, but I had ridden far enough into the wind for the day. Got a motel room and checked around the roadhouse. In the bight south of here are whales (others saw some from overlooks yesterday, though I did not). 84 km today, 17983 km cumulative. Today started with a sightseeing trip via airplane. We flew from the roadhouse over the "head of the bight", the northernmost part of the southern ocean south of Australia. We saw 26 whales, mostly mother and calf, remarkably close to shore. Whales are found in these waters between June and October. 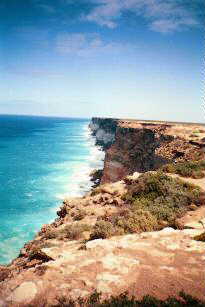 From the head of the bight eastwards were some large sand dunes and beaches. To the west was start of the dramatic row of cliffs. Impressive to see them from the ocean side. Behind were vast stretches of treeless Nullarbor with pockets of wombat burrows, some now homes to foxes and dingos. We also flew over entrances to three or four caves. It was an impressive view. The sightsee trip came about as I had been talking with the pilot from Whaleair the previous day. Last night he knocked on my hotel room along with a customer (Evan) and asked if I'd be interested in joining. Seemed fun to me, as long as it wasn't too late. Hence, our 7 am departure. Evan was a bit excitable, e.g. he brought along a bugle on the flight, though fortunately the pilot put that away and out of reach. Bad luck with cameras continues. Last night, I noticed my camera missing, lost, strayed or stolen. Left contact details at Nullarbor Roadhouse and hope it shows up. After taking care of this, was past 9:30 am when I left. Big question for today was the wind. At 1000 ft, it had been blowing 40 knots from the north, thus mostly a crosswind. The initial route was very bare Nullarbor landscape. My speed was barely 10 km/h as I pushed the wind. Saw a dingo after a few km. He seemed more curious than afraid. At 15 km was turnoff (12 km) for the road to head of the bight. This is Yalata aboriginal land and whale watching permits are required. At 18 km was a sign for "Eastern Edge of the Treeless Plain". Between the two signs is only 20 km of complete treeless area. 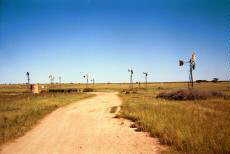 However, are with almost no trees seems to go from Border Village to 30 km east of Nullarbor Roadhouse or about 200 km. This gap is supposed to be much larger further north, e.g. where the train crosses. At 25 km the road turned a welcome fifteen degrees further from north. At 30 km another slight turn as well as a few trees. My speed increased as winds were less and from better direction. The last 2/3s of the ride today had more rolling hills including a few long hills such as at 71 km. Slowly rode over the tops of these hills. Along the way, I encountered horseflies, ouch! Amazing how well they could land on my legs as I was pedaling and giving a good bite. With a late start, decided to stop at Yalata Roadhouse. This is aboriginal owned and operated roadhouse, though staff working are white. Caravan park, a few cabins and roadhouse here. 93 km today, 18076 km cumulative. Today a nice ride to small town of Penong. Warmer riding today, with a strong NNW breeze. Learned a bit more about whales from the Yalata Roadhouse yesterday. The southern right whale once numbered 100,000 plus. They were hunted to point where only 2000 remain. Of these, 500 visit Australian waters. Every three years or so, a whale makes a trip north from Antarctica to breed or teach young to swim. The young are born without much blubber, so these warmer waters are ideal. The 5000 km trip takes the whales a time as their maximum speed rarely exceeds 9 km/h. It was fun seeing them yesterday morning. About 3 km from Yalata Roadhouse was a turnoff to aboriginal Yalata community (no alcohol, no cameras, permits required). Another 4 km further was a grid and large fence designed to keep dingos from SA farming areas. From this point trees were mixed with open grasslands and occasional farm buildings. Still some rolling hills but less than yesterday. Winds out of NNW thus varied between crosswind and tailwind. Overall was able to make good time and reached Nundroo Roadhouse just prior to 9 am. Their breakfast grill was not yet started, so had cold breakfast items before setting off again. Reasonable progress as it started to get warmer in the morning. More pastures and farm buildings. Windmills still turning swiftly. At 57 km was turnoff to Fowlers Bay. This road returned 30 km further. It was shortly past 1 pm when I came into Penong. Penong was situated on a hill with signs indicating one should eat remaining fruit to prevent spread of the fruit fly. In addition to fruit flies, also many little houseflies buzzing around today. Managed to keep all but one from flying into my mouth. Penong had a roadhouse, caravan park, shop, hotel/pub and laundry. Hence, biggest town since I'd left Norseman. The roadhouse had a sign, "Please do not ask for water. No pipeline and no bloody rain." Many of these roadhouses have similar signs. There seems to be two classes of water: rainwater and bore water, with rainwater being particularly scarce. Bore water generally tastes ok here. I've also had to buy water once or twice. 131 km today, 18207 km cumulative. I made it across the Nullarbor. Yeah! As crossings go, I think Kununarra to Broome (the Kimberley) or Broome to Carnarvon (the Pilbara) have longer gaps and are more remote for cyclists. However, the Nullarbor has the "I crossed the Nullarbor" stickers, patches and other paraphernalia... I also caught less favorable winds in the Nullarbor crossing than the Kimberley or Pilbara. Strong winds from north as I left. Forecast called for top of 37°C (98°F), so I was on the road early. Just outside town was a collection of at least 20 windmills all turning in the breeze. The route today had gentle hills and went past wheat fields and pastures. I must have been riding pretty slowly in the crosswind. At 16 km as I was passing (aptly named) Windy Hill Farm, a campervan stopped. "I can give you a ride to Ceduna..." "No thanks, I'll be fine." The crosswind was strong enough to also blow me a bit from side to side and cut my speed to 60% of normal. I stopped one more time at an underground water tank before reaching a bend in the road at 37 km. Wow! My speed quickly doubled as I caught a tailwind component. Along this way were signs to several old school sites. Looks like many former country schools must have been consolidated. At 63 km the road bent back, but I was now close to Ceduna. Just outside Ceduna was a quarantine station for fruit and veggies and checking for fruit flies. While I didn't have any fruit left, at least 40 hitchhiker houseflies were riding on my bike as I passed the quarantine. They would occasionally stop and buzz my face. I didn't swallow any today. This is a long holiday weekend (Labour Day, except WA which celebrates the Queens birthday) and start of school holidays. It is also the 11th Oyster Festival in Ceduna. I found a spot at the backpackers hostel ($AUS 15.00, with decline in Australian dollar, now less than $US 7.50...they said it was normally $AUS 20.00 but that included a meal) and went off to the festival. I saw the small town parade. 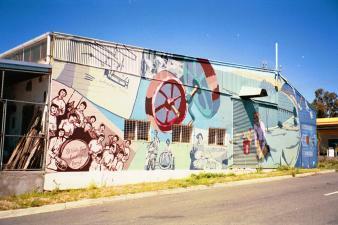 It had all the local youth groups, the fire engines, an overabundance of souped up cars and local dignitaries. Also went to see the oyster opening contest. In the women's amateur division the "Oyster Opening Queen" won in opening 12 oysters in 2 minutes 36 seconds. In the professional division they were given 30 oysters to open in a minute and a half. Walked through many different tents of food, carnival rides and souvenirs. Enjoyed the festival and otherwise an easy ride day today. 72 km today, 18279 km cumulative. Overnight a front passed through. Thunder, lightning and heavy rain. Fortunately dry when I started. After 9000 km, my front tire has bare patches as well as a slow leak. After riding in a puddle, I can see bubbles on outside of the tire. Today the route was mostly flat and went through fields of wheat and hay. Small snails had crept onto the road and would go crunch as I rode over them. At 6 km out of town was a road junction. Eyre Highway to Port Augusta was 462 km. The alternate route via the Flinders Highway was 745 km, but was supposed to be beautiful. I took the longer route. Green wheat fields and yellowish fields of grass. Not much in the way of either shoulders or traffic. Occasional side roads through the fields. At 41 km was a turnoff to Smoky Bay. I could see waters off in the distance. At 89 km was nice overlook over Streaky Bay and Perlubie Beach. Streaky Bay was named due to light and dark streaks in the water. Off in the distance were silos of Streaky Bay town. At 102 km the road came to a junction and headed west. Surprisingly strong crosswind had developed by now, so slow going the last 8 km into town. Streaky Bay has small main street, visitor center with mounted shark and row of shops. Still strong winds in the afternoon. 110 km today, 18389 km cumulative.